Taiwan's Industrial Technology Research Institute (ITRI) claims that Taiwan can still compete with Korean panel makers (Samsung and LGD) in the flexible AMOLED market. The institute says that help from the Taiwanese economics bureau will be required. Upstream suppliers will need to ramp up their development effort and boost production facilities and materials. Samsung had plans to release their first plastic-based flexible OLEDs in 2012, but this has been delayed to early 2013. LG Display hopes to start flexible OLED production towards the end of 2013. ITRI has been developing flexible OLED technologies for a long time, and unveiled a 6" flexible OLED prototype back in 2010, based on their FlexUPD technology. More recently, ITRI has developed a full roll-to-roll process on 100um flexible glass substrates - they say they're the first in the world to do so. ITRI has been collaborating with Corning on this technology, and they are using Corning's flexible Willow glass, unveiled at SID 2012. 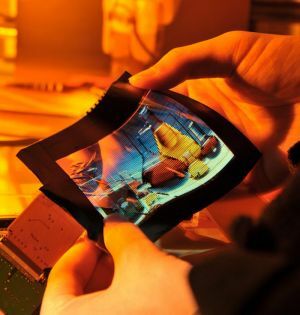 Taiwan's AU Optronics is actively developing flexible OLED technologies, and back in November 2011 they unveiled a 4" flexible AMOLED prototype. (shown above). AUO's 240x320 4" panel is made on an Oxide-TFT (IGZO) backplane, is a bottom-emitting device and it's only 0.3mm thick and can be bent with a curvature radius of 10mm. 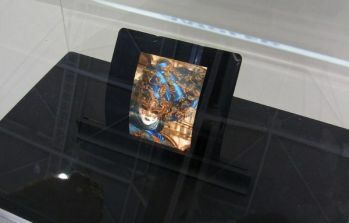 The second largest display maker in Taiwan, Innolux, is also working on small and medium OLED panels with plans to start low-volume production in Q4 2012, but as far as I know they haven't yet discussed any flexible OLED technology development. Here's more info on Innolux's OLED program.